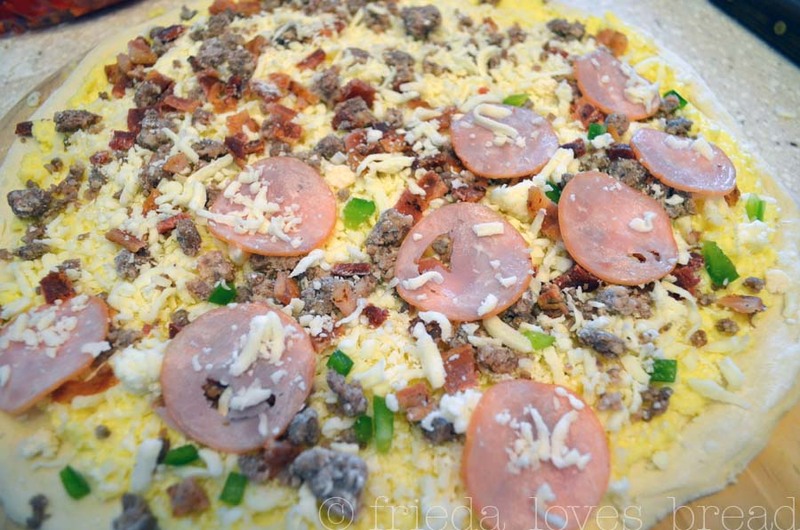 Do you think your kids would enjoy this pizza for breakfast? If you like breakfast burritos or even a breakfast casserole, you will enjoy this pizza. 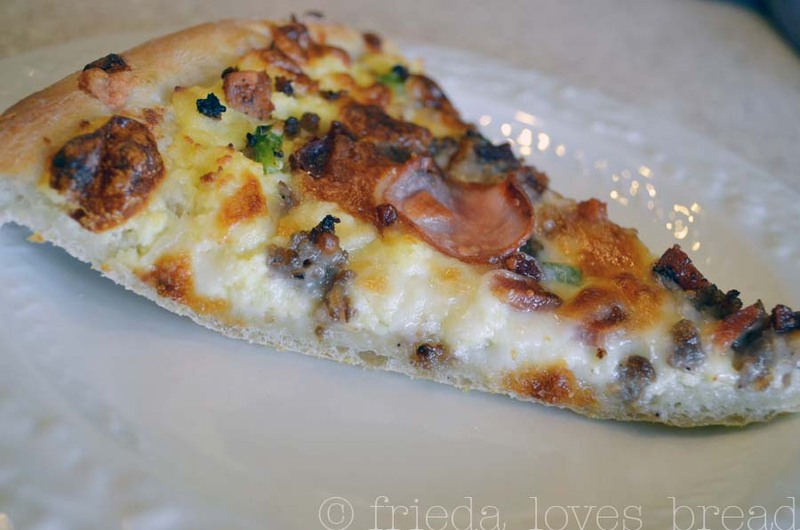 You can use a store bought pizza dough, ready made crust or make your own dough. 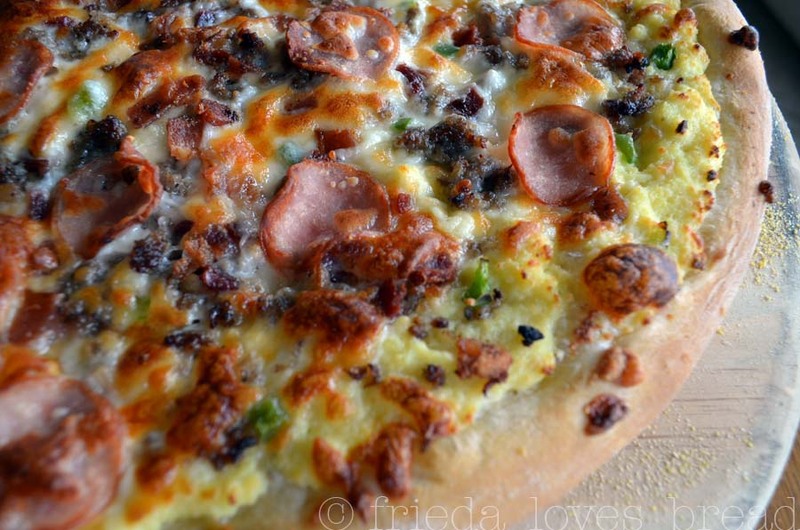 The secret to this pizza is the creamy egg base that holds all these yummy toppings together. 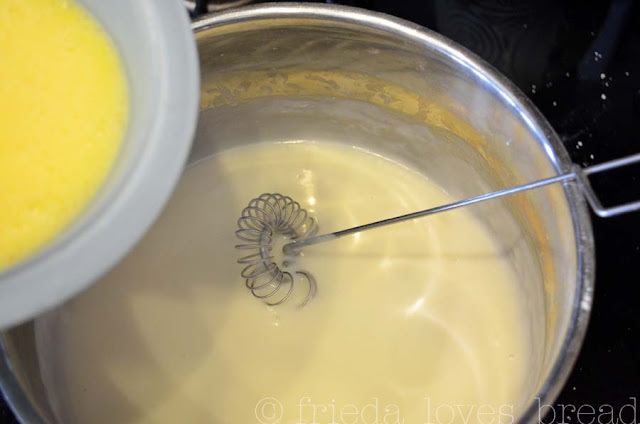 In a saucepan over medium heat, melt your butter and add your flour. This is a simple white roux that is the base of most sauces and gravies, like in my chicken pot pie, chicken dumplings, roasted chicken gnocchi soup, or homemade chicken gravy. 2) Cook your flour for a couple of minutes to prevent the "raw flour" taste. 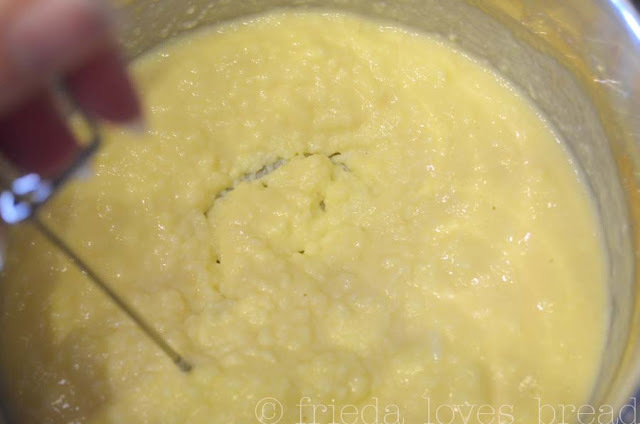 ... pour your beaten eggs directly into the roux. Cook over medium heat, until the eggs become soft-set. Be careful not to over-cook the eggs. You want them to be soft and creamy, not stiff and rubbery. 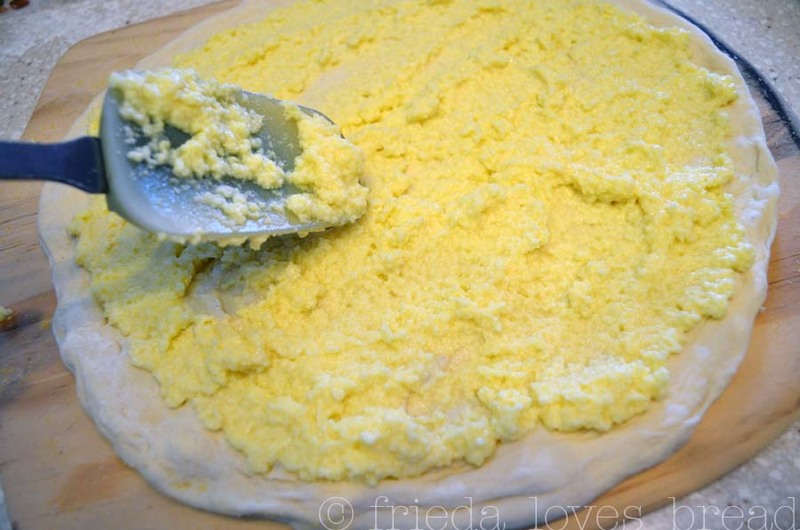 Spread the egg mixture on top of your shaped pizza dough. Top with any of your favorite breakfast toppings: Canadian bacon, sausage, bacon, diced red or green peppers, onions, sharp white cheese and mozzarella cheese. You can bake this on a parchment lined baking sheet or a pizza stone. I love using a pizza stone, as it cooks my pizza dough evenly, creating a crisp crust throughout. Bake until the pizza is has a golden brown crust and the cheese is brown and bubbly. Wow ... even the creamy eggs have a touch of golden brown! 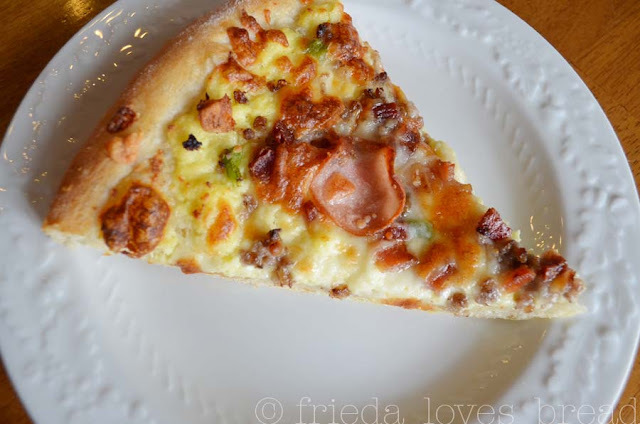 You don't have to have breakfast pizza in the morning. You can have it any time you want! 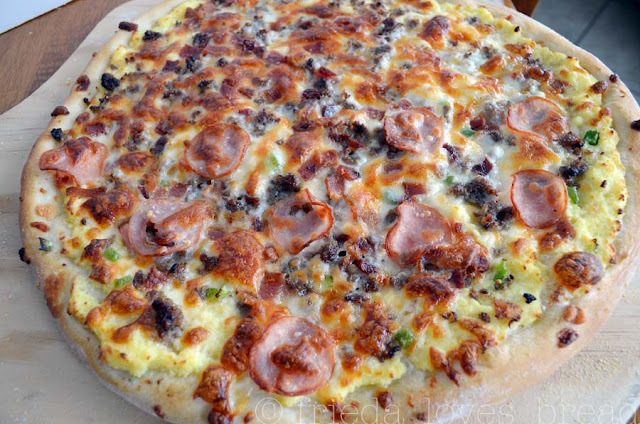 Ok, I think this breakfast pizza looks mega-delish and such an interesting way to do the eggs. Question- I, too, love my pizza stone (it's no longer brown- it's black). But what I don't love is the slow turn around time. Here's what I mean: I cornmeal my paddle, spread out my dough, dress it with topping, place it in the oven. While that one is baking, I can't figure out how to make another pizza on the counter and then scoop it up onto paddle without mangling it. So I have to wait for one pizza, in this case, is done before I can shape and assemble another one. 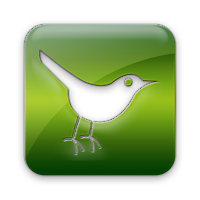 Would you mind addressing this in a post sometime? Pretty please? Mindy, I cormeal my paddle and put the rolled/stretched dough on top of my cornmeal, just as you described, but the dilemma is getting the baked pizza out of the oven, right? You then have two options: 1) buy another peel (paddle) or 2) use parchment paper in place of your cornmeal on your peel. Sometimes I grab the corner of the parchment after baking and slide it onto the back of a cookie sheet andtake out the pizza out that way. 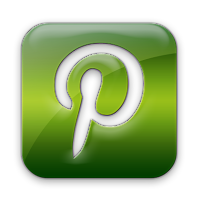 Try it and let me know how it worked for you.